While the politicians squabble over the future of Hyderabad, Hyderabadis fasting and shopping during Ramadan. 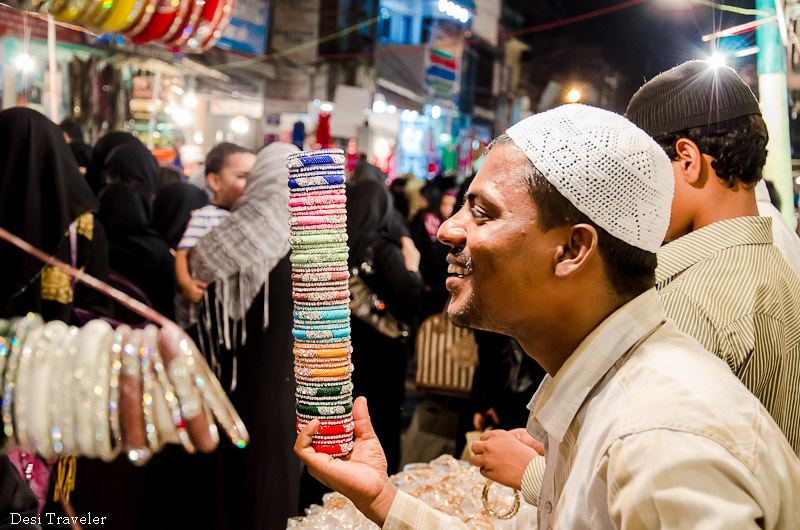 The area around Charminar has a special significance during Ramazan, as there is a special Night Bazaar for Ramazan that keeps open till 2-3 am to cater to the shopping frenzy of Hyderabadis in the night. I was to meet my friends from GHAC for Ramazan near the Purani Haveli and then walk all the way to Charminar enjoying the street food, Irani Chai ( a special Hyderabad style tea with origins in Persia or Iran) and shopping, but the old city had other plans for me. As there are a lot of traffic restrictions in the area we decided to hire a cab and go to the old city. 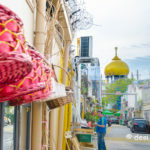 I am unable to say what route the cabbie followed but we straight reached one end of the famous Laad Bazaar or the Bangle market on one of the arteries leading to Charminar. We got down from the cab once traffic was no longer allowed and started walking toward Charminar. As for me I was just enjoying being lost in the sea of humanity that has been coming to Charminar during Ramazan for generations, for who coming to Night market during Ramazan comes naturally. 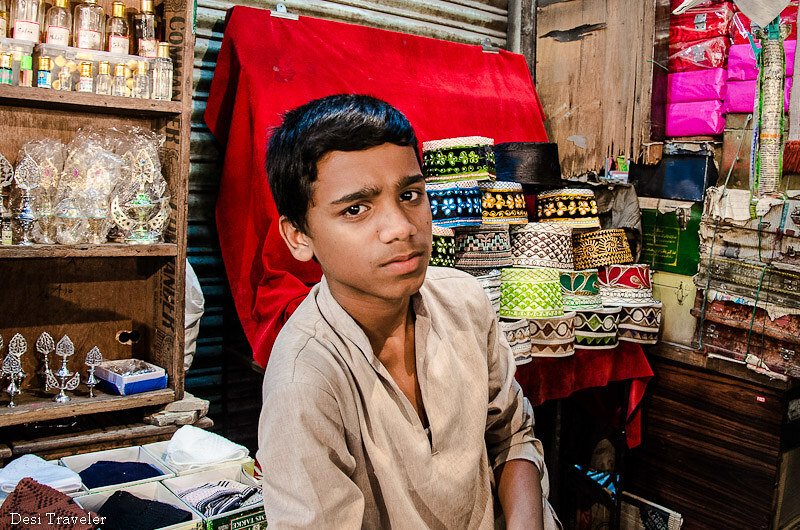 The shopkeepers were calling loudly in Deccani / Hyderabadi, which is such a distinct dialect that there are movies like ” The Angrez”, made in Hyderbadi dialect specally for the local audience, but have a global appeal. “ Madam/ Sir, have a look, no price for looking” knowing very well that once somebody looks at the glittering bangles or smelled the heavenly “Attar” ( perfume), it is impossible to keep money in the pocket. So quickly money exchanged hands and my backpack started becoming heavier with every shop we visited. 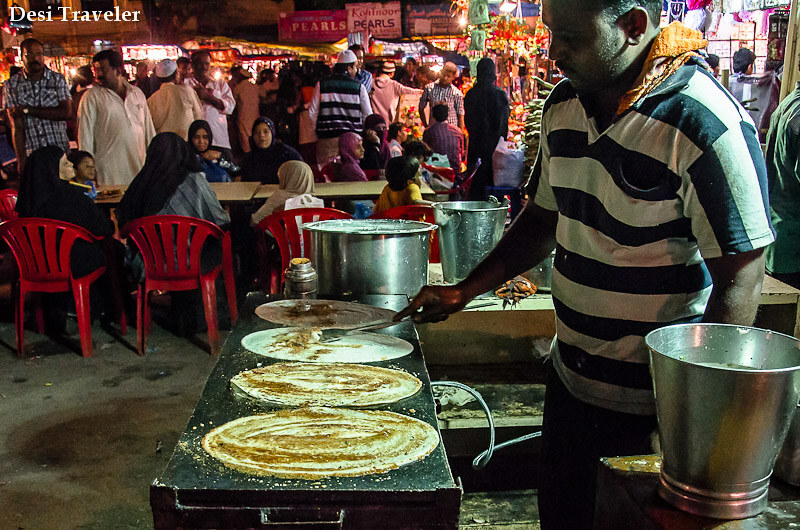 Now while Hyderabad is famous for Haleem during Ramazan, this did not stop this Dosa Stand doing brisk business. So don’t worry if you are a vegetarian like me, you will still have enough for choice to spoil your taste buds. 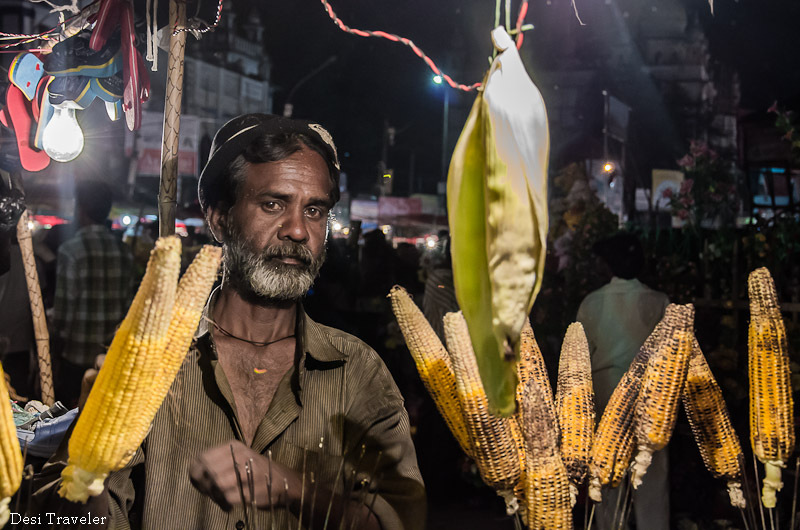 Not only the Dosa wala, but also the Bhutta wala (Corn on the Cob Indian version heated on open flames of charcoal) was doing brisk business. 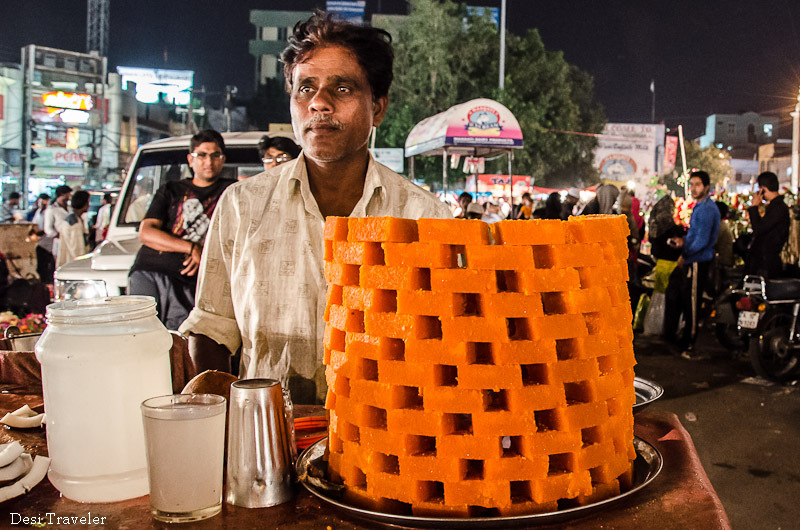 For sweets we had this guy with his “Tower of Sweets“, trying to compete with Charminar in height. We have never experienced Old Hyderabad like this before, the Charminar, Laad Bazaar, Pather Gatti Road all the way to Mecca Masjid is blocked for vehicular traffic during Night Bazaar for Ramazan, but two-wheeler riders continue to roam freely creating a nuisance for pedestrians. 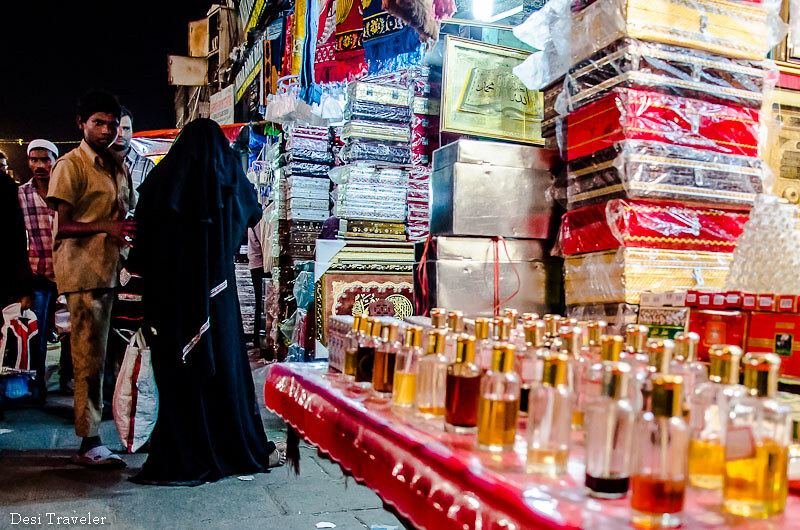 We started walking towards Medina, but the charms of the Ramadan Night Market were so that we could barely cover half the distance as we were stopping at every shop, bandi ( kiosk) checking the goods on offer. So we could cover only 1/10 of the distance when the kids got tired and we had to call it a night with Old Hyderabad just warming up. 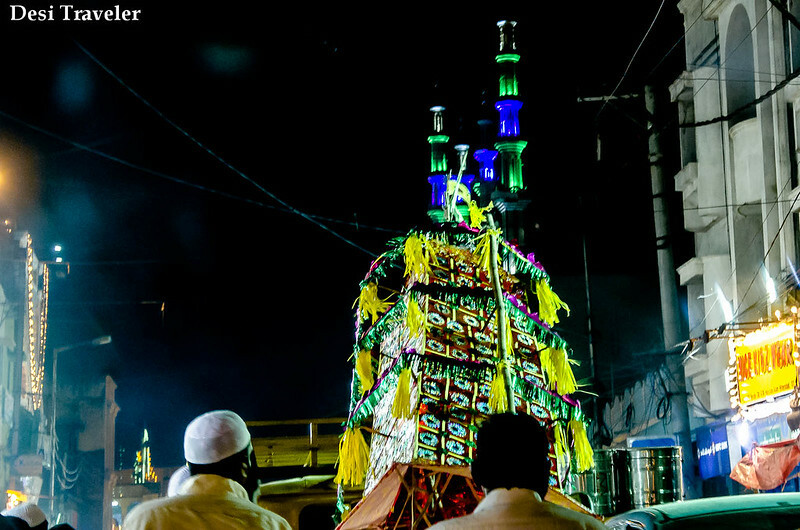 While coming back, I saw this huge crown to be offered for Bonalu, to Devi Maa (Mother Goddess), being carried on a mini truck, when it passed in front of a Masjid the colors of Bonalu and the glowing Minaret of Mosque merged. For me that is the true essence of the fusion culture of Hyderabad, living and celebrating together the common heritage of hundreds of Years. I think this essence of Old Hyderabad is what makes the Attar sold in miniature bottles near Charminar so special. 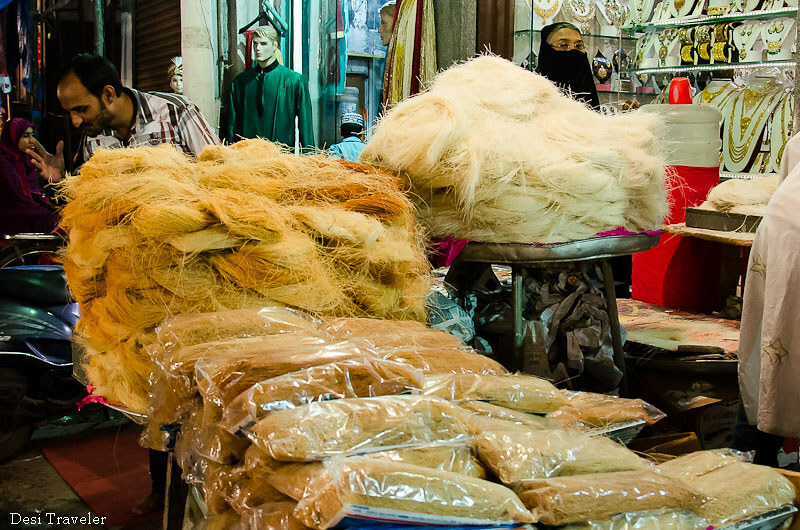 What could be more fragrant than the culture distilled over hundreds of years by generations of Hyderabadis? 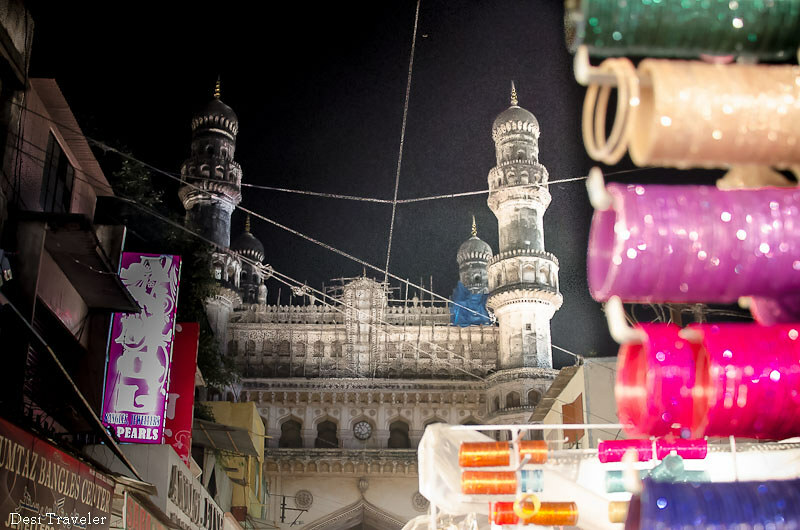 Tips for Visiting Ramazan Night Market at Charminar: Better to park at a distance and walk, you will get parking near Salarjung Museum, Purani Haveli and near Osmania Medical College Koti, then walk. Or you can hire a cab/auto if you do not want to struggle for parking. Points to Remember: Do not drink alcohol and visit the Night Market during Ramazan time, remember it is the holy month and people are fasting. 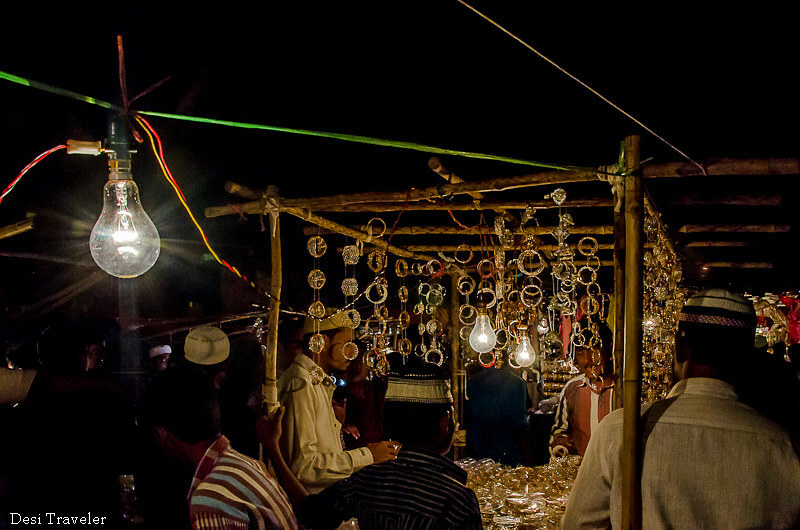 It is absolutely safe to visit the night market and most of the folks are smiling and welcoming you to try their stuff ranging from Bangles to Attar, Caps, Artificial Jewelry, street food etc. Just be careful with your jewelry and pockets as there could be pickpockets around like any crowded market anywhere in the world. Please do not click pictures without taking permission, more so of ladies and kids. 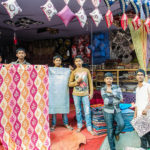 Dress Code: During Ramadan, it is suggested to dress conservatively respecting the local traditions, Kurta Pyjama for men and Salwar Suit for ladies is what is suggested. 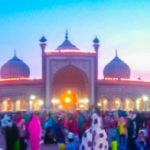 Ramadan or Ramazan: I have seen both spellings on the internet and this is what I have understood: In Arabic countries the spelling used is Ramadan, and in Indian Subcontinent Ramazan is more prevalent. In this post, you will find both as I was not sure which one to use. But in Hyderabad, most of my friends spell as well as say Ramazan. Also, read my new post about Ramadan Food Festival Bazaar in Singapore. 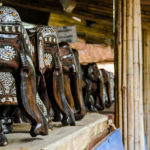 If you have liked this post, then please feel free to subscribe by email , like this post and share it with your friends on Facebook, LinkedIn, Twitter and Google+ . Hi, I’d like to share your photos for my article about laad bazaar on a public platform with your due permission and credits to you. Let me know if you’re ok with it. Thanks and regards. I am sure Ramadan would a festive time at night! I have been to some iftaar parties…and its a rocking world. 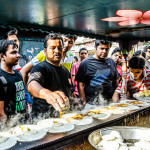 Have you seen the Md Ali road in Mumbai during these days…its food galore! 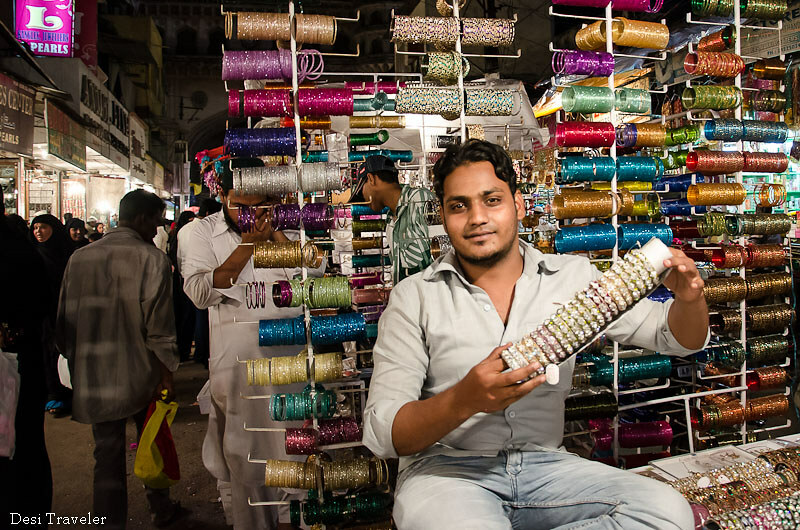 I was in Hyd last wek and bought so many bangles….its a riot of colours! I lived in Hyderabad from almost 4 years but somehow never managed to visit the night market during ramzan. Your post took me there. Thanks for this lovely post. related to custom styles and habits..
this is by far one of the best Eid coverage post my dear friend 🙂 awesome !! I have been to Hydbd once during Eid and I could relate to the charm and buzz and Halim being the fav stuff for all the non vegies.. regardless of their faith and even I tasted a bit .. to accompany my friends … the charm of the Secundarabad area enhances … and you have captured time .. !! Loved your photographs and description, Prasad. I had another virtual tour. I am living in hyderabad for the past 10 years. I can count the number of times i have visited here due to the uncertainity prevailing in the area and the distance.My last visit was when an MP of this area was shot , the whole area looked deserted. We took a risk and went to the area around 4 in the eve. We drove straight to chowmahalla palace and on our return around 6, we saw the area came to life. we had parked our car in the government hospital opp charminar and it was difficult to drive on the road. 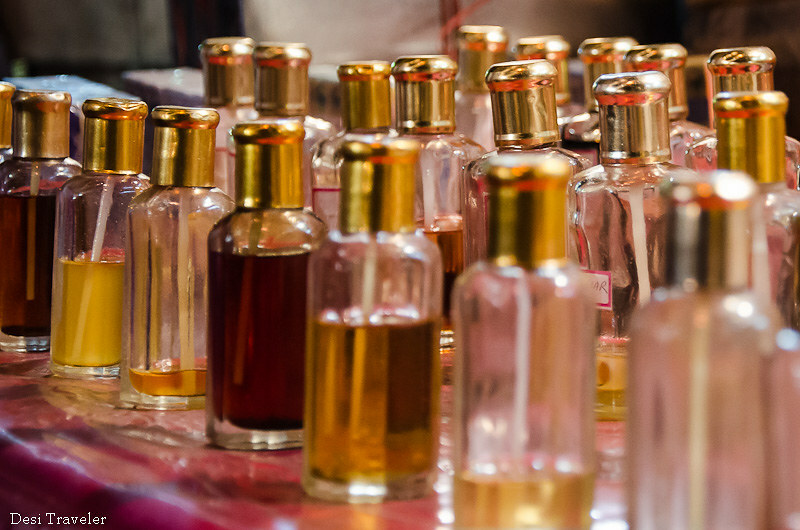 I missed clicking the reflection through the attar bottles. Been there done that but not during ramadan. I too bought beautiful bangles for 80rs and gifted them to relatives. Thanks Asha..fortunately things are normal now and people are enjoying the festive spirit. Slurrp…Ogle…Sigh…Your post was a treat for all the senses! Vivid and beautifully captured .. those moments of bliss ! Thanks Bushra.. would love to see some pics from Bangalore..
wow..how colorful and glistening has the whole market turned into. Love the festive spirit within the peple and shop keepers. Hi Jiggyasa…Whole Charminar area is decorated like a bride during Ramazan…Thanks a lot. Thank you for the lovely walk! Beautiful pictures with interesting commentary! I am from Hyderabad and love visiting Charminar during Ramadan. Especially love getting bangles from lad bazaar! It is a special experience, isn’t it?